← Goals, Rubrics, and Bears… Oh My! It’s been far too long since we have last posted, but for good reason! 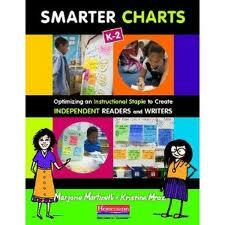 Our book Smarter Charts is in its final stages. It has required quite a bit of work, but we are so pleased to give a tentative release date of August 16th! Mark your calendars, date books, and set reminders on your phones! We will keep you posted on its progress. So, in celebration of our return to blogging, we are returning to some classrooms we have tracked throughout the year at PS 1 in Manhattan’s Chinatown Neighborhood. Let’s take a tour of what these lovely ladies have been up to in the past few months! One of the great skills of the teachers at PS 1 is their understanding of the inherent power in a simple tool. In Rosie and Jane’s first grade ICT classroom, they are deep in a unit that teaches about characters in books through role playing. 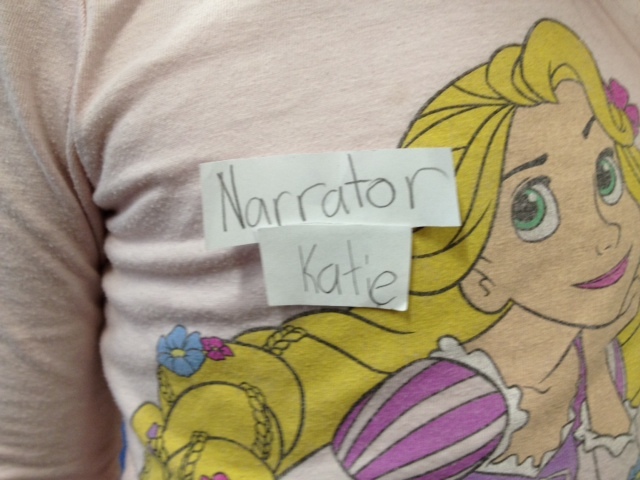 Jane and Rosie have worked to make the work of role playing easier for their students through the use of a few simple tools: blank labels that students can use to label their job in the acting (director, narrator) and pre-made cards with visuals (actor). 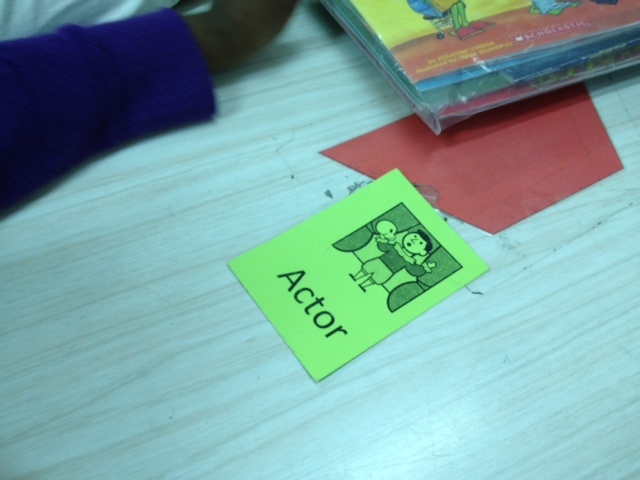 When children sit down to work in their groups and act out a text, the first thing they do is use these tools to assign roles. 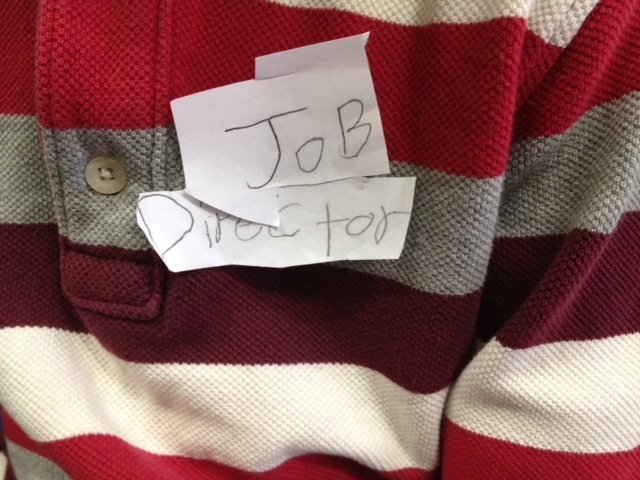 This step has organized children’s thinking, streamlined management, and provided a gentle prompt reminding children what job they have in book club time. Simple tools sometimes carry the most powerful outcomes. This chart also comes from Rosie and Jane’s ICT classroom. The first graders are wrapping up their last narrative unit of the year and the skills being taught (as reflected on the chart) have grown more sophisticated. Ending a piece with a sense of closure is part of the first grade common core state standards (available at corestandards.org). Jane and Rosie support a variety of ways books can end to support the wide range of writers in their room. Student samples sit next to the mentor texts showing what the work might look like when a first grader attempts this big work. This work hails from Amy Carpenter’s room, another first grade teacher st PS 1. Amy (like all of first grade) has been studying Mo Willems as a mentor for writing. As a final celebration, Amy and her class composed their own Pigeon book using some of the same craft spied in Knufflebunny. 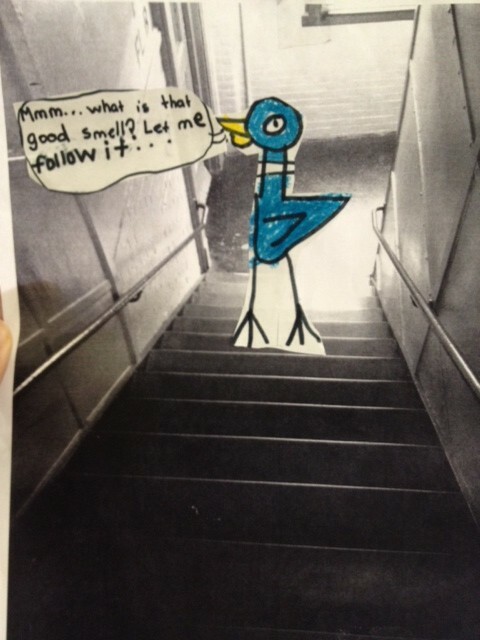 The class dreamed up a story, Amy took and printed photographs, and teams of children inserted Pigeon and his dialogue. Together they have created an engaging class story and celebrated the work of the unit! Reading AND Writing in ONE! 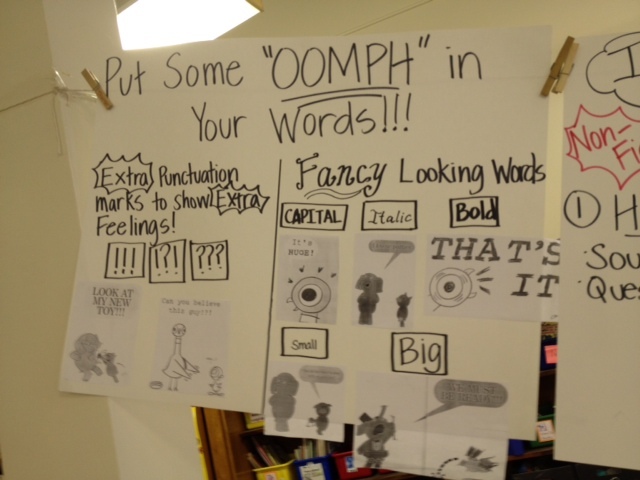 This chart from Rosie and Jane’s room is hard to classify as writing or reading as it supports both. One challenge that many students have in writing is using show not tell, and it’s sister skill in reading, inference. 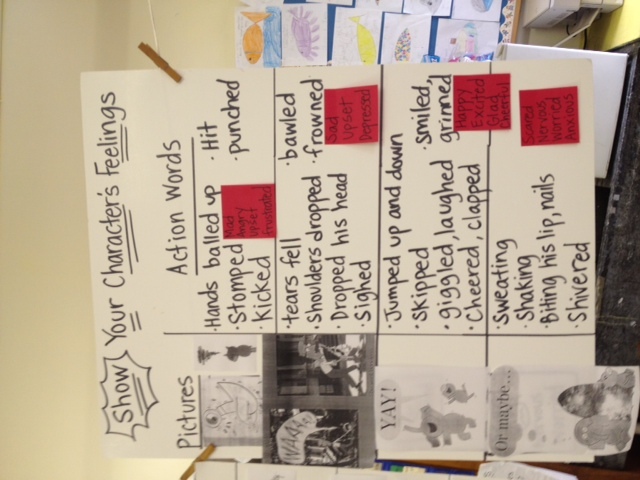 This chart closes the gap for children by showing emotions in photos, describing the actions in words, and then, on the red post-its, matching the feeling words that go with those actions. This chart can be used by a child trying to show an emotion in writing (start at the red post-its, find the feeling you want to show and use the action words with it) or a child trying to determine an emotion in reading (start at the pictures of descriptions of actions and move to the red post-it that names the feeling. When reading and writing work aligns it is incredibly helpful to create charts that support both areas. This is another chart that straddles the divide between reading and writing. The reading work of closely attending to clues is highlighted on the top half of the chart. This work allows children to make smart inferences and predictions. 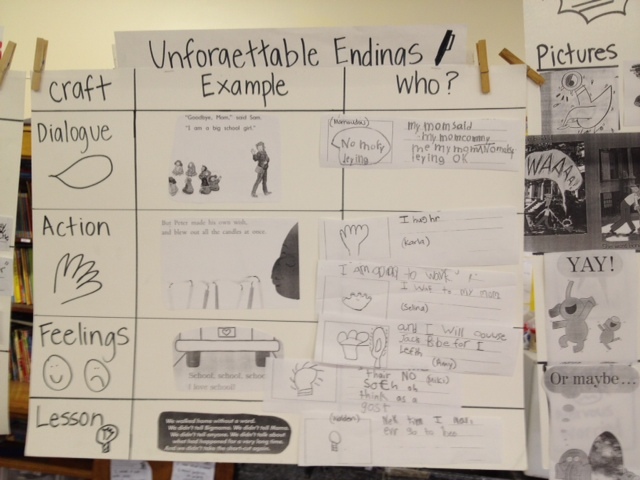 The bottom half of the chart supports writers as they attempt to do the same work in their own writing- which builds tension in a narrative piece. 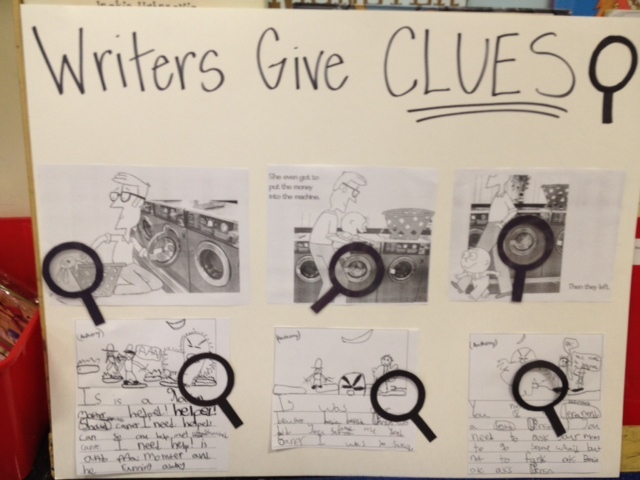 The use of the magnifying glasses encourage children to look closer and really study the work of writers. Thank you for sticking with us in our absence, and we will be posting more regularly once again! You have been missed – however, these charts are fabulous and couldn’t have come at a better time! A book?! I can’t wait, I can’t wait, I can’t wait! !